Owing to our expertise in this field, we are able to offer our clients a wide range of wrought iron stair railings. 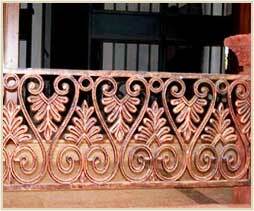 These railings are fabricated from optimum range of iron material as per the international quality standards. Our product range of stair railings are prized for its dual hand rest facility, gripped hand rest slopes and attractive design. Size : 4'-6" x 2'-9"